Bidet toilets have been used for centuries in Eastern Europe and have now made their way to other parts of the world. 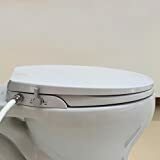 Bidets offer many benefits that concern your personal hygiene ‘down there.’ With the option of a bidet toilet seat, there is now a lesser need to have a completely different unit installed in your home, saving both space and money. Below is a guide to help you determine which type of bidet may be the best fit for you and your family. There are two different types of bidet toilet seats: electric and non-electric. Non-Electric: These bidet toilet seats tend to cost less than their electric counterparts. 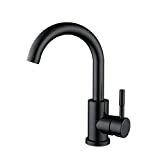 These models can offer both cold and hot water settings, depending on your preference. Most non-electric bidet seats do not have all the features that are available in the electric models— some may include feminine wash and self-cleaning nozzles, but you’d be hard pressed to find many additional features other than that. So if you are looking for something simple and not too costly, this is your best bet. Feminine wash: the nozzles of the bidet adjust to the angle that is needed by females due to the difference in anatomy. Heated seats are a great feature especially for those living in chilly climates! Heated air dryer: this feature may be able to eliminate the need for toilet paper, saving you money while being environmentally friendly. After the bidet wash is done, warm air is concentrated to the wet area, making you both clean and dry. Oscillating cleanse offers a complete rinse without having to move your body and adjust to every angle. Water pulse cleanse helps to remove any solid matter more efficiently. Enema wash is a feature offered in some bidets and can help with constipation and hemorrhoids. Air deodorizer: There is no spray emitted, but odors are absorbed through a filtration system, leaving your bathroom with a normal scent. Bidet toilet seats also come in two shapes— round and elongated. Before buying online, it is advisable to go and try out the seats to see which one fits most comfortably. Installation and adjustment has been said to be non-demanding and even enjoyable for most models on the market. For the kids. 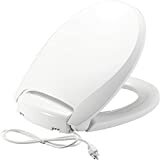 Many parents have insisted on buying a bidet toilet seat for their kids, as it helps to clean those spots they may have missed, therefore preventing rashes and irritation on those sensitive areas. Water pressure and temperature. Customers have enjoyed the bidets that have varying water pressures or cleaning features, as everyone has different needs for comfort. People loved the models that offered continuous hot water, but also had the option of turning on the water cooler. 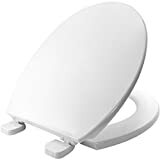 Your bidet toilet seat needs to be able to fit properly on your existing toilet. For further information regarding to the size you need, check out this sizing chart. Shop around to make sure you are getting exactly what you desire. If you have a remote control, set it in a place where it can be easily reachable once seated on the toilet. For many models this is how you control the water pressure, temperature, and other features of the bidet. Buy a seat that has a warranty of at least two years, as this can say a lot about the durability and make of the seat itself. 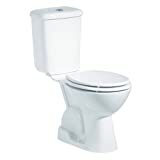 CleanSense: Offers an energy efficient bidet, known as the dib-1500R. This bidet allows you and your family to customize and save your settings on the remote control for an even better experience. Brondell: A leader in the bidet toilet seat market and has been since 2003. It offers both electric and non-electric models, and its Swash seat has won numerous awards due to the quality standards the company holds itself to. BioBidet: Produces a top-selling model known as the BLISS Premier Class Bidet Seat, which also comes with a 100% 3-year warranty.